A grin explodes on to my face, a grin so big that I feel it will rip it apart. I’m standing on the summit of Mau Son in Vietnam’s Lang Son Province and can see the rest of the country stretching away to the south, while China stretches to the north. There are mountains as far as the eye can see and, after six days of motorbike trekking, the glory of it is simply profound. 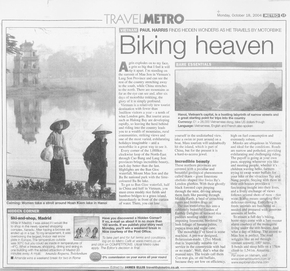 Vietnam is a relatively new tourist destination with fewer than 3 million visitors a year – a tenth of what London gets. But tourist areas such as Ha Long Bay are developing rapidly, so leaving the herd behind and riding into the country leads to a wealth of mountains, rural communities, striking views and one of the most varied, exhilarating holidays imaginable – and a motorbike is a great way to see it. Every corner of the 1,000km clockwise loop of the North-East through Cao Bang and Lang Son provinces brings incredible beauty, each day better than the last. Highlights are the Ban Gioc waterfall, Mount Mau Son and the Ba Be national park with the lime colored Ba Be lake. To get to Ban Gioc waterfall, half in China and half in Vietnam, your must cross muddy rice fields and bamboo bridges to a grass island, immediately in front of the curtain of water. There, you can lose yourself in the undisturbed view, take a swim or punt around on a boat. Mass tourism will undoubtedly hit the island, which is part of China, but for the present it is a hard-to-access jewel. These northern provinces are covered with a peculiar and beautiful geological phenomenon called skarn – giant limestone obelisks shaped like Swiss Re’s London gherkin. With their ghostly black forested caps peeping through the mist, driving among them feels like passing through Middle Earth, a land of crouching tigers and hidden dragons. The sun transforms this into a sublimely beautiful Garden of Earthly Delights of terraced rice paddies nestling under the imposing limestone, bordered by lush foliage of banana palms, papaya trees and sugar cane. The motorbike I’ve hired is some machine. A pre-war designed Belarusian-made, 125cc Minsk that is especially suitable for service in the countryside with bad or no roads. Well, that’s what the manual says. The locals call them con trau gia, or old buffalo, because they are low on efficiency, high on fuel consumption and extremely robust. Minsks are ubiquitous in Vietnam and ideal for the conditions. Roads are narrow and pothole, providing exhilarating and challenging riding. The payoff is going at your own pace, stopping whenever you like and meeting people, whether it’s children waving hello, farmers trying to swap water buffalo for your bike or the vivacious Tay and Nung people. Staying with them in their stilt houses provides a fascinating insight into their lives, and a lively exchange of views follows several shots of ruou – rice wine. It also means sampling their delicious cooking. Everything is fresh; animals are butchered as needed and prepared with generous amounts of herbs. To ensure a full day’s biking, home-stays come with a 5am rooster alarm courtesy of the menagerie living under the stilt house. And what a day of biking. The ascent to Mau Son is perfect. The road wriggles like an eel through verdant scenery, 180 degree turns, S-bends and steep hills on a 15km climb to 1,541m. Amazing.